This 3-mile hike leads to the old Snead Farm. It’s one of the few hikes in the park that really shows off what life at the turn of the twentieth century must have been like for the people who made their homes where the park now stands. The barn at the old Snead Farm is still in good shape. Most of the other structures are gone, only foundations left. 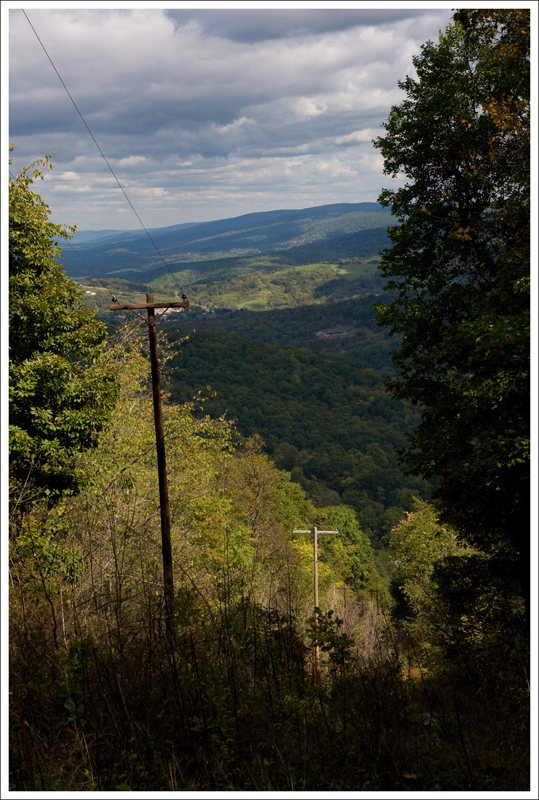 Below: There is a view from the fire road before you follow the final fork to the farm. The walk to Snead Farm is really easy and perfect for families. Much of the trail is level and follows a fire road. There are a couple of route options, too. 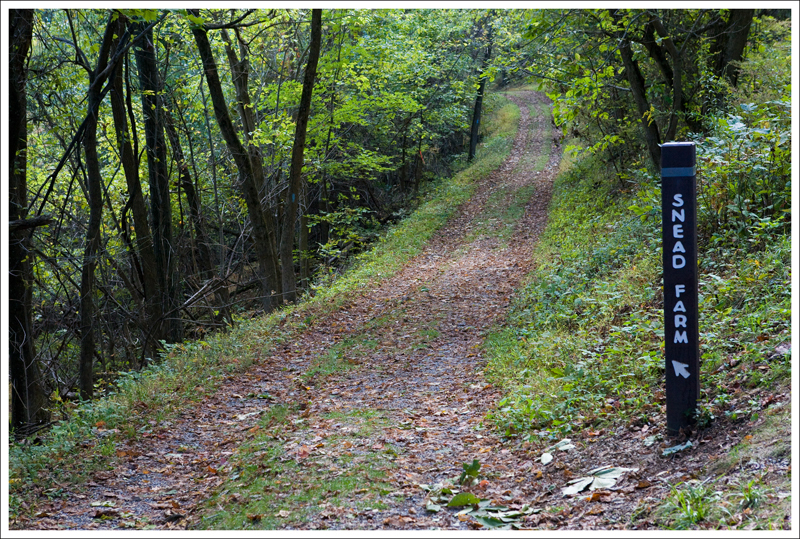 If you start from the visitor’s center, you’ll walk .8 miles on the Dickey Ridge trail before reaching Snead Farm Road. This ends up making a three-mile route, and is the route we followed. You can also start from Skyline Drive, directly on the Snead Farm road. This cuts the route to a mere 1.4 mile out-and-back. Just be sure to follow the correct forks in the road, or you’ll find yourself on a walk to nowhere (like we did… more about that later). Whatever route you choose, the going is easy and relatively level. As far as I know, Snead Farm has the only remaining barn left standing in the park. In fact, it’s one of the few non-park structures of any kind left standing within the boundaries. The doors are barred closed, so you can’t go inside – but you can peek through windows and gaps in the doors to see the old hayloft up top and animal stalls on the lower level. 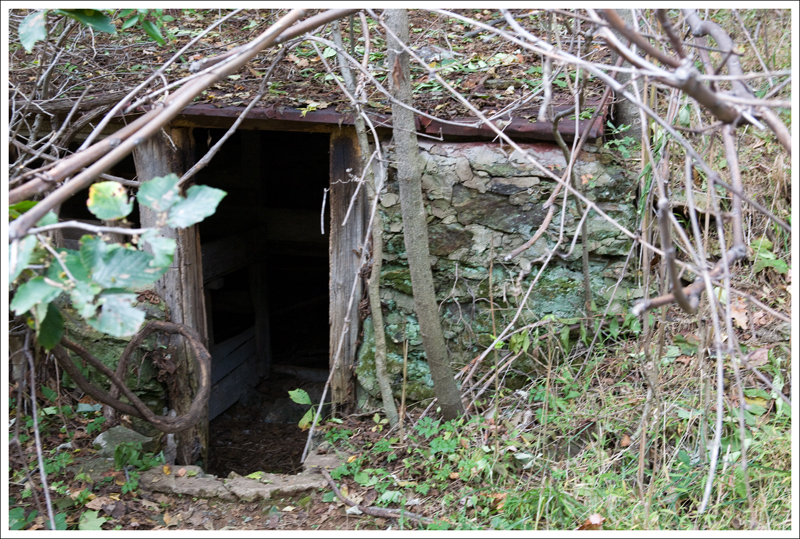 Behind a tangle of vines, you can still climb down into the root cellar located behind the barn. The cellar is deep and lined with sturdy shelves, which undoubtedly held stores of food for the farm. The main house’s foundation and several sets of stairs still stand slightly uphill from the barn. The boxwoods that stood on either side of the front door are still there. They have grown tall and wild! 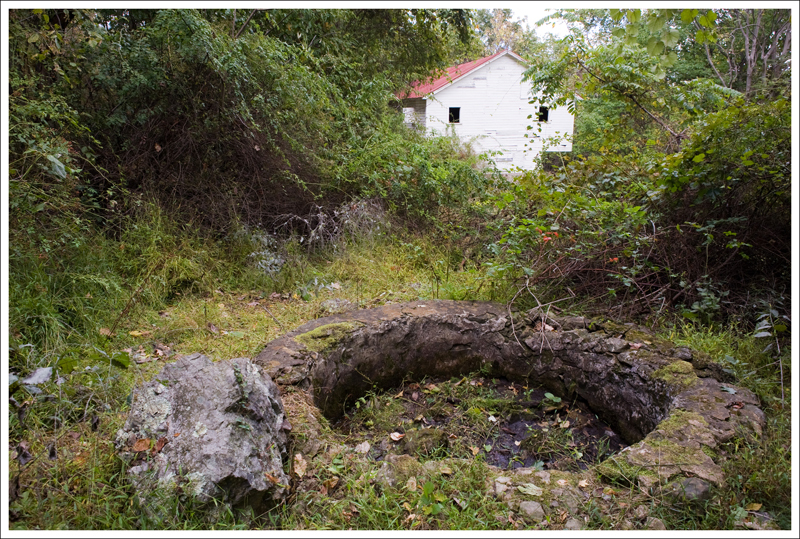 The cistern is still there as well. The farm was occupied until the early 1950’s, so the site doesn’t feel as old as some other places in the park, like Pocosin Mission. Our hike to Snead Farm ended up being longer than we were expecting. We were using our Falcon Guide Shenandoah National Park book as a guideline and there was misleading information in the book. I’ll try to set things straight with our own directions. From the Dickey Ridge Visitor Center, cross Skyline Drive and walk to the flagpole. Take a right at the plaque with hike information. In .2 miles, you will come to the intersection with the Dickey Ridge Trail. Take a right here and proceed for about .3 miles until you reach a fire road (Snead Farm Road). Take a left on the fire road. In another .2 miles, you will reach a fork on the trail. Stay to the left. In another short distance, you will come to another fork where you will see a concrete post. Go to the right, heading uphill. You will continue this trail for about .5 miles until you reach Snead Farm. You will begin to see the barn through the trees. We did misinterpret the information in the book since it told us to take a left at the last fork. Since we were going a different way than the book, we ended up second-guessing ourselves. When we thought we had gone far enough, we decided to turn around and take a different fork. When the other fork came to a dead-end at a utility building, we realized we had been going the right way. We went back the way we came, took the correct fork, and made our way to the farm. We ended up adding only an extra mile to our hike, but after doing a couple of other hikes that day, we weren’t in the mood for more miles. The Snead Farm Fire Road is pleasant walking. 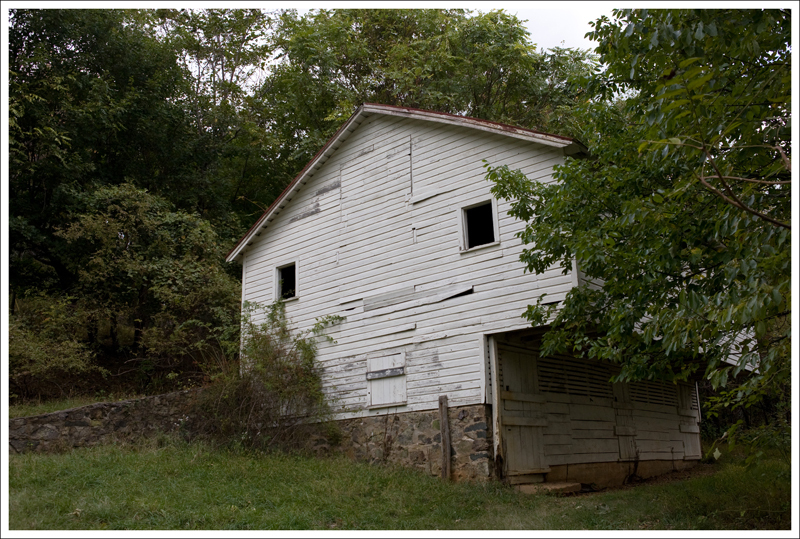 Below: The old root cellar is still standing; Another view of the barn. Christine and I marveled at how well-maintained the barn looks. Since it was abandoned in the 50s, it is clear that the park service has kept up with maintaining the barn and even painting it. I wonder if this will be a permanent part of the hike or if the park service will one day let this building fall prey to the elements and the woods. Overall, this hike was a decent leg-stretcher and a good family hike. Difficulty – 1.5 An easy walk down a mostly level trail. Trail Conditions –3.5. Half of the trail followed the Dickey Ridge trail which was well-maintained and the rest is on fire roads. Views – 1.5 Some views are seen from the final fork to get to Snead Farm. Wildlife – 2. You may run into some of the usual park animals like deer and birds. Ease to Navigate – 2.5. The turns did us wrong, so we’re marking it down. Solitude – 2.5. This is a popular hike due to the proximity to the Northern entrance to Shenandoah National Park and the short distance. Shortly after you reach the fire road, you can take a right onto a trail that takes you up into the hills. This will take you up to Dickey Hill before giving you the option of bearing left towards Snead Farm – you can then take the fire road back. The loop is a longer hike, but much more interesting and rewarding. Thanks for the route alternative idea, Ben!